Delightfully, I drove the 2019 Silverado High Country some four hours north to my home in Sudbury, Ontario, Canada just in time for a Chevrolet Silverado winter review. Some seriously bad weather was rolling in, and the weatherman on the radio began warning motorists to stay off of the roads. I didn’t listen. I like driving in nasty winter weather when well backed-up for the task. That’s because I find driving in treacherous winter weather to be relaxing, as the highways snaking through northern Ontario are often near-empty, and speeds are reduced, and you’re sort of forced to sit back and relax and take things slow. 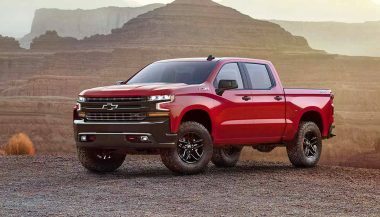 The tested 2019 Silverado High Country is the upscale Silverado. For shoppers who want all of the good stuff. Including the available 6.2 liter, 420 horsepower V8 engine. Silverado’s new 10-speed automatic transmission. And nothing short of a laundry list of feature content that intends to enhance comfort, safety, convenience, and connectivity. More importantly than all of that on this particular winter drive was what was beneath. An essential part of a Chevrolet Silverado winter review. My tester’s 22-inch wheels wrapped in a quality set of Toyo winter tires. Which ensured traction was rarely an issue. Whether braking, steering, accelerating, or evading a hazardous-looking chunk of ice flung my way from the roof of a nearby 18-wheeler. 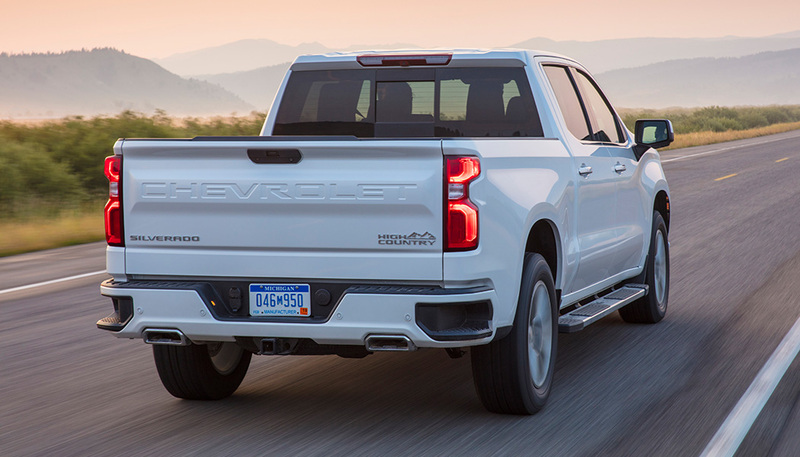 Like every all-new pickup ever launched, this new generation of Silverado is larger, more intelligent, quicker, more potent, and more connected and safer and more upscale than ever. Despite being a larger rig, it’s also lighter than its predecessor. They’ve even made a stronger bed and reinforced the tie-down points in the box. Chevrolet has even added a handy tailgate that’s motorized in both directions. I can confirm this works properly, even after being intentionally iced up by your writer at a coin-wash. 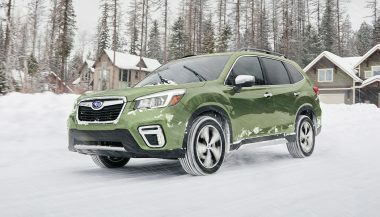 In frigid temperatures and while carrying a mass of frozen snow and slush accumulated during a four-hour highway drive through a snowstorm, it worked flawlessly. The face isn’t everyone’s cup of tea, though it did grow on me. It manages to identify Chevrolet’s latest pickup unmistakably, even from a quick and distant glance. The face is a big change from the last-generation truck. The cabin is not, however. Chevy took it easy on the restyling. 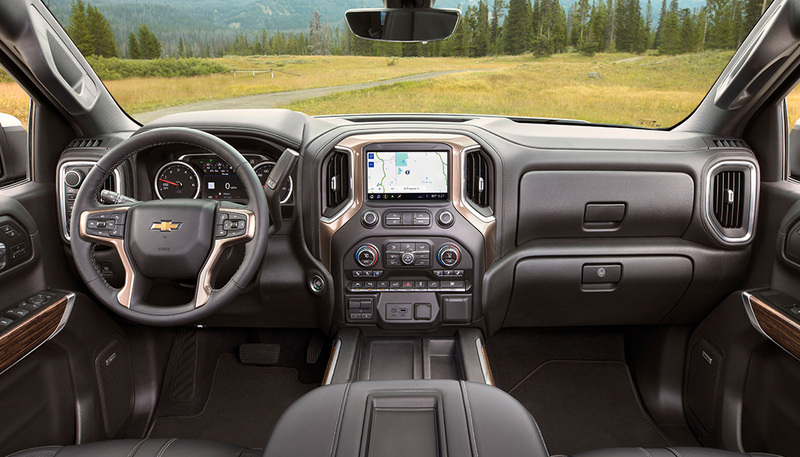 Apparently, last-generation Silverado owners said that they liked the interior of those units. So much so that designers decided to leave things largely familiar. The result is that this latest cabin looks like a slightly reworked version of the last Silverado’s interior. There’s more attention to detail and a richer materials palette. Though there are also loads of switches, readouts, dials, controls and interfaces that many owners will already be familiar with. Clever feature content touches included a slick and vivid Head Up Display (HUD), small storage cupboards built into the rear seat backs, and a wireless charging pad for your Smartphone. One that’s ingeniously chilled from beneath to help keep your handset from overheating during use. Drivers can watch any part of the Silverado they like on the camera system. Or bring up a parking camera view that shows 360 degrees of your surroundings in a single screen. The rear view mirror is also a camera-fed display screen that works much better than a conventional rear view mirror. Though a simple flick of a switch turns it back into a standard mirror if you think camera mirrors are a bit much. Even larger adults will find plenty of room in all directions at every seat. A good outward view, too. Whether front or rear seats, big or small people, and as much stuff as you’d like to bring along. There’s room to spare. My tester’s included built-in Wi-Fi connection and household power outlet were easily appreciated in instances where passengers needed to be connected and productive on the move via their laptop. Also notable are the LED headlights. Which blast thick, white and vivid white light far up the road in the deep, dark winter. Add in the automatic lights, automatic climate control, firey-hot heated seats and a piping-hot heated steering wheel? You’re well backed for comfortable travels, even in nasty weather. Ride quality was also notable. Even in very extreme cold, my tester’s suspension remained consistently quiet and compliant. The highway ride often falls into luxury sedan territory—smooth and soft—which is a unique experience. Drivers can expect potholes, expansion joints and tar-strips passing beneath to be audible, but rarely felt. Even on the roads of Northern Canada, which are mostly blown to pieces, it never felt like I was going to break something or turn one of those big wheels into an octagon on this Chevrolet Silverado winter review. 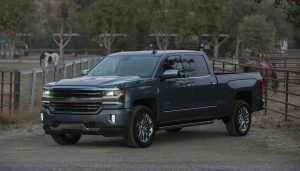 All said, the Silverado High Country should prove an exceptional long-distance cruising truck. With ride quality as its most valuable asset. The 4×4 auto setting worked flawlessly in all conditions for set-it-and-forget it winter operation. Other modes are available, but this one works the system like regular All Wheel Drive. Calling the shots on your behalf, reacting immediately to slippery stuff like ice and snow, and leaving drivers no decisions to make. When stopping, the brake pedal feel and precision are more confidence-inspiring than I usually expect in a pickup. The action of the ABS, when engaged, is so smooth, it requires a light to appear in the instrument cluster to advise the driver that it’s working. 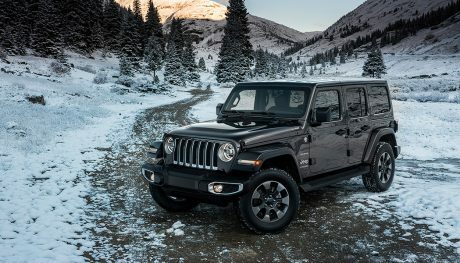 The big V8 packs 460 pound feet of torque, meaning that even minuscule throttle inputs glide it along quietly, with minimal revs and minimal need for gearing down of the 10-speed automatic. Drive gently, and the engine is tastefully restrained. Push it, and it’s a properly meaty rumble. My main gripe of my tester related to its road manners in one specific situation. Partly thanks to the enormous wheels, sharp and fast dips encountered at highway speeds can see the Silverado’s rear end become startled. Especially on slippery highways. These bumps cause the tail of the truck to wriggle around vigorously a moment before the stability control system (and your attentive driving) get things back in line. This may be frightening to some drivers and often necessitates the need to quickly correct the steering to keep the truck in line. Some information suggests that this is less of an issue when shoppers skip the 22-inch wheels. All said, the driving experience and high-tech feature content hit hardest with this machine. It’s a smooth, quiet performer that’s also a relaxing bad-weather tourer. With great manners, great traction, great lights, and a great ride that’s long-haul ready. 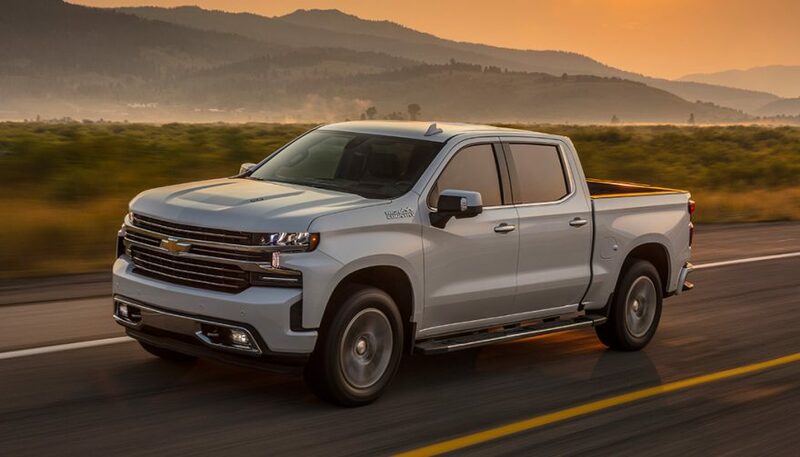 Though the cabin design won’t blow anyone’s socks off, you’ll likely find the 2019 Silverado High Country to feel like it’s giving you your money’s worth. Especially when driven for extended periods in bad weather like in this 2019 Chevrolet Silverado winter review. 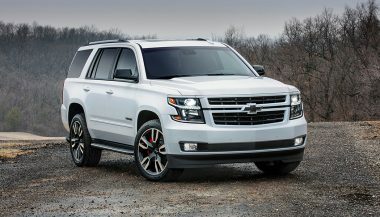 The 2018 Chevrolet Tahoe is basically a Chevrolet pickup truck with a passenger compartment on the back instead of a box. Want to know more? Read on!